Our summer gala concert on Saturday 23rd June 2018 is the highlight of the 40th anniversary celebrations. The orchestra was founded in 1978 to raise funds for repairs to the organ of St Olave’s Church and the 40th anniversary concert will also raise much needed funds for the church. The concert starts at 8 pm, and is in St Olave’s Church York. Surely it can't be 40 Years? 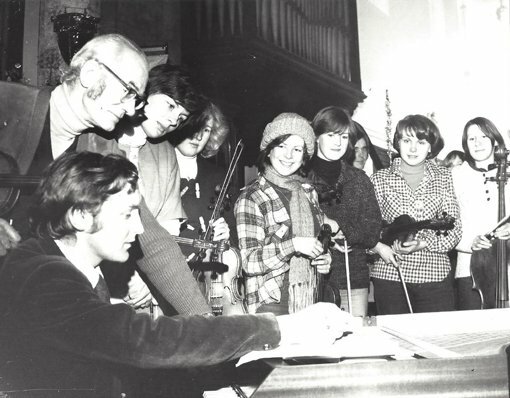 Surely it can’t be 40 years since a few of us, mostly students and school pupils, were brought together by my erstwhile Headmaster and violinist, the redoubtable Robin Gilbert, to play some Baroque pieces in St Olave’s church for a concert to raise funds for the lovely Walker organ in the church! The organ was in a poor state and the St Olave’s organist, a young chap I didn’t then really know, Charles Macdonald, who was also assistant organist at The Minster, was in despair. It was late 1977 and, for some reason long forgotten, Charles, Robin and I were sitting in The Minster Inn trying to fathom how a band could be got together with the aim of raising funds to restore the organ. Perhaps we had just played a Trio Sonata concert in the church..? Charles had little or no conducting experience, but he played the harpsichord and could direct from that. Charles wanted to play his way through the Handel organ concertos and for those, Robin could direct from his place as leader. Robin had tabs on musicians who were pupils, former pupils or staff of his school, Easingwold, and also contacts from an orchestra he used to run in the Easingwold area called ‘The Galtres Players’. Robin and Charles quickly decided that concerts would need to be during university vacations so that students would be home and available to play. And I think it would have been Robin who decided that the orchestra would have a particular interest in encouraging young players. So The Academy was born, together with its rather ostentatious name, which the first concert programme from January 1978 defines as being a bit tongue in cheek, but based on the Italian ‘Academia’ (concerned with educating…) and no doubt hoping some glitter would rub off from the well known ‘Academy of St Martin in the Fields’ (which I believe Neville Mariner also directed from the violin). 14 of us played a collection of Baroque pieces in that first concert and if you come along to our 40th Anniversary concert on June 23rd, you will find a facsimile of the programme for that first concert. This has only just come to light, courtesy of Carole Glasby, one of the players, who went on to be Librarian at The University of Gloucester, and had kept it neatly filed away all those years. Once a librarian, always a librarian! 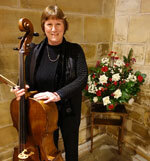 Although she mainly played violin in those days, Carole is now principal viola of The Cheltenham Symphony Orchestra. 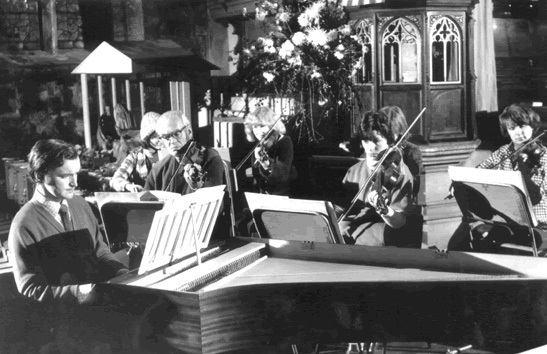 Carole (now Wrightson) also sent us a couple of Press photos, one of which shows a few of the orchestra huddling together in thick coats rehearsing for that first concert in the church. One of the cellists in that photograph is Karen Humphreys, who went on to be Principal of the Junior Royal Northern College of Music in Manchester. Over the years the orchestra has gone from strength to strength. Although still a chamber orchestra, the music we play ranges from Renaissance to 20th Century, and we do stretch the definition of ‘chamber’ rather a lot in some concerts! We take ourselves much more seriously these days too and have a reputation to keep up, focusing on achieving as high a standard of performance in concerts as we possibly can. Gone are the days when a rehearsal was deemed to have been a complete failure if we had not packed up and arrived in The Minster Inn by 9.30 for the last hour of drinking time! If Charles and Robin were here to hear us these days, I think they would be on the one hand astonished, and on the other justifiably proud of the ball they had set rolling. 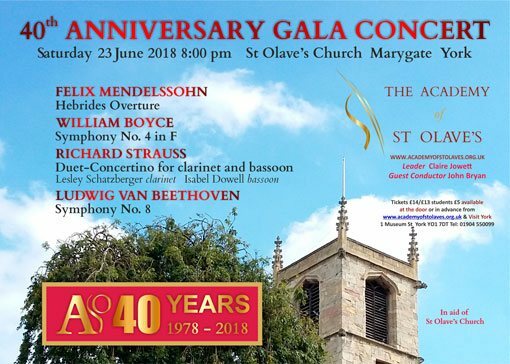 The Academy of St Olave’s 40th Anniversary Gala Concert is the first event in the Summer Music Festival at St Olave’s Church. This is an outstanding series of concerts! 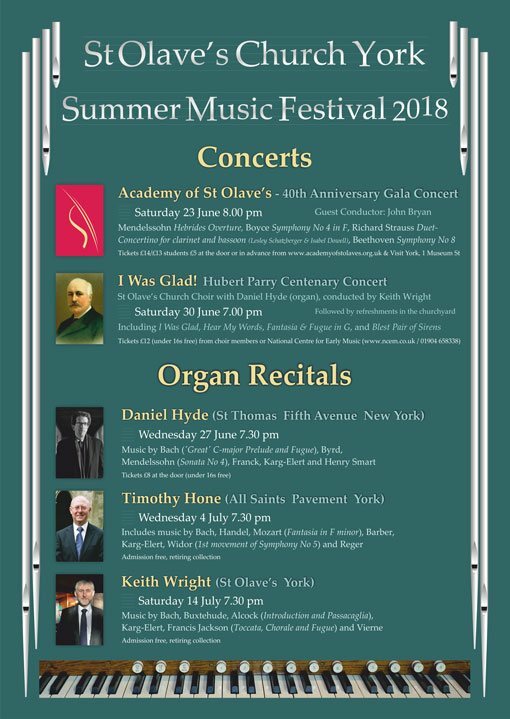 Of special mention is Daniel Hyde – the organist at St Thomas, Fifth Avenue, New York – who is coming over to the UK especially to perform at St Olave’s. Daniel has just been appointed as the next Director of Music at King’s College Cambridge, starting in autumn 2019. Click or tap on the flyer below to see a larger image, for reading the small print. ASO is very pleased to welcome John Bryan as Guest Conductor for our 40th Anniversary Gala Concert. Alan George is busy with a series of concerts with the Fitzwilliam Quartet and is sadly unable to be with us this time. 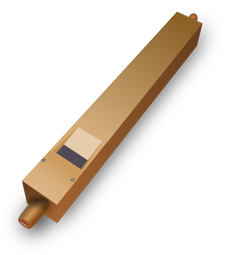 The Duet-Concertino for clarinet, bassoon and strings by Richard Strauss is a delightful piece! 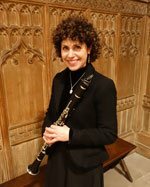 There are two superb soloists – Lesley Schatzberger and Isabel Dowell – both of whom are regular players in the Academy of St Olave’s wind section. 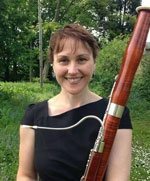 With a variety of music from baroque and classical through to the romantic and modern eras, all played in the gorgeous surroundings of St. Olave’s Church, what better way to round off a warm, sunny summer’s day? Tickets for our concert on Saturday 23 June can be purchased in advance from our website, or from Visit York, 1 Museum Street, York. Alternatively, just come along to the concert at St Olave’s Church between 7 and 8 pm and you will be able to pay at the door. Directions for getting to the concert, complete with map, are on the How-to-find-us page of our website.